Recently I had the opportunity to display and sell my wares and talents at the Belly Swap Sale and Hafla. Every year Shifting Sands hosts a belly swap where vendors and members can bring in their wares, their costumes they no longer use, jewelry and many other items having to do with belly dancing and not having to do with it. The amazing ladies in my troupe, Seraphina Fire, are not only talented in their dancing, but we’re all pretty crafty as well. Seraphine Fire purchased vendor space, and set up shop. The rest of the girls’ stuff… and my computer, lol. It wouldn’t be Seraphina Fire if there weren’t a few… shenanigans. And this year, I actually left with more money than I spent… though not much, lol. I’ve recently realized that there are a lot of beads in my collection that I just don’t have a specific use for. Back when I first started making jewelry for myself (and eventually others) I’d just buy whatever beads caught my eye, or what was required for a special order or gift… and then some. The extras went into generic slots in a few of my bins – usually organized by color or type (i.e. Swarovski Crystal… which I ALWAYS need more of). My Swarovski Crystal bin… I’m always refilling this one. Now, I only buy what I will use… whether I have a flash of an idea for that bead/piece or I am getting something specifically for an order. I’ve been thinking of possibly selling off some of the random beads in batches, and I still might. But one of my kids asked me to make him a Shamballa bracelet… and I hadn’t ever made one before, so I looked it up. They’re actually pretty easy to make in my opinion, and I had it made in a matter of minutes for him. But it got me to thinking on all this cotton crochet thread I have that would work wonderfully with this and other bracelet techniques… so I pulled out my random bins and started making bracelets. In just a day, I’ve made ten different bracelets of varying color combinations (not even close to exhausting my color choices, lol). Close up of the Swarovski bracelets. So, what do you think? Would you buy these? Happy Day AFTER the 4th of July! Happy Day After 4th of July to all my American friends, and those living in the States. Hope your day was full of BarBQues, popsicles, drinks and fireworks! Living in Las Vegas, there is an almost endless list of places that set off their own fireworks… From the Air Force Base, to the various “Locals” Hotels, to the three cities encapsulated in the Las Vegas Valley, and even one more city that’s just past the valley, the choices are almost limitless. Normally, we attend the Air Force Base’s 4th of July celebration. There are toys, games, water slides, bouncy houses… food, or you can bring your own… and a spectacular fireworks display. Here is a pulled back picture from the show last year. Yes, I AM under an airplane… I believe this one is under their display of the Stealth Bomber. I usually move a bit more forward, but I wanted a reference of where we were sitting. Unfortunately, this year there was no celebration at the base due to sequestering. So, we had to figure out a different activity this year. A family friend lives across the street from one of the city parks that the city celebrations are held at, and her backyard has a great view of the fireworks. Not so great for photos as there are power lines, lights and power poles obscuring part of the view of the fireworks. So, being as it was the first time I’ve ever shot the pictures from her backyard (I usually set up my camera in the perfect spot at the base to get clear shots, lol) there was a bit of a learning curve… especially considering my hubby just bought me a newer, upgraded camera body (cue squees and happy dancing…). So, here are a few shots I got from the show this year. Enjoy! When this family contacted me for a large family session, including their kids and grandchild, I couldn’t resist. We met up at Lake Las Vegas and had so much fun wandering all over picking spots for full family shots, couple shots, smaller family and individual shots. We took so many pictures it’s really hard to pick just a few for their Sneak Peek. But, I gave it a try. Thanks for letting me goof off with y’all that day! Recently I had the blessing of getting to work with some amazing kids. A very dear friend of mine, Kim, asked if I would be willing to take some pictures of her youngest daughter and her grandkids. Since her daughter is one of my favorite people in the whole world there was no way I was going to say no! We met up at the Las Vegas LDS Temple and had some fun. I’m sure I don’t have to tell you that these kids were HAMS! Thanks so much, Kim, for letting me spend the day with your kiddos! Enjoy your Sneak Peek! Along with all the crafts I do, I’m also a performer. I’ve been dancing pretty much my entire life (from the age of 3), and while my body isn’t always happy with me when I over-do it, I perform when and where I can. Sometimes I teach ballet, sometimes I perform with “old” acquaintances and friends, and sometimes I perform with my troupe – we are a fire/fusion dance troupe – Seraphina Fire. Basically, we do a sort of fusion dance with different styles of belly dance mixed with other disciplines (i.e. ballet, jazz, hip-hop, etc.) and we perform with fire implements. I personally perform the most with the fire fans, orb and palm torches. While the following anklet was created before I started performing with my troupe – simply because I wanted one for myself – I actually sell more of these now that I am part of the performing community I am a part of through my troupe. As of right now, I’ve sold all of my ready made versions of this anklet… but I always have the supplies to make more. Yes, it jingles with every step you take, but it’s a lovely soft jingle. What do you think? Is it something you’d wear? Or something you might like to try? 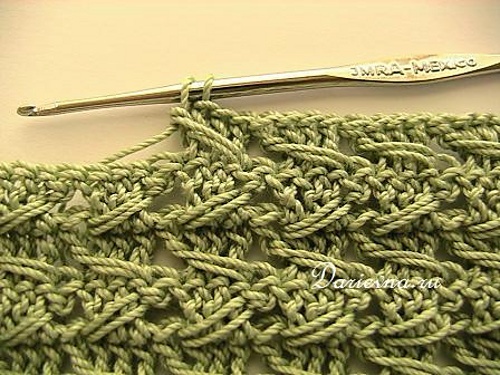 Yarn Works – Current Projects – What Else? Right this minute I think I have about five projects going. What I feel like doing dictates what is being worked on at any given time. That or if I have an order, lol. 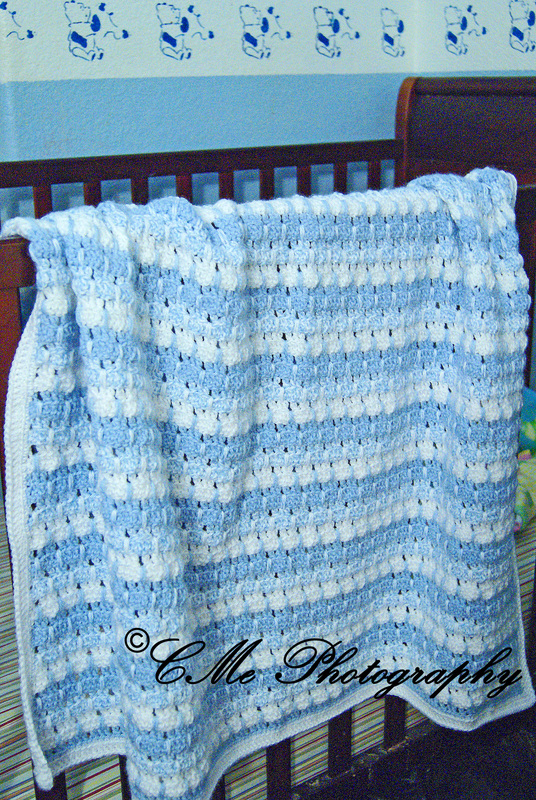 One type of project I love to work on are baby blankets. Why? Because they are mini-afghans (unless you do them larger) and everyone who gets one loves it! 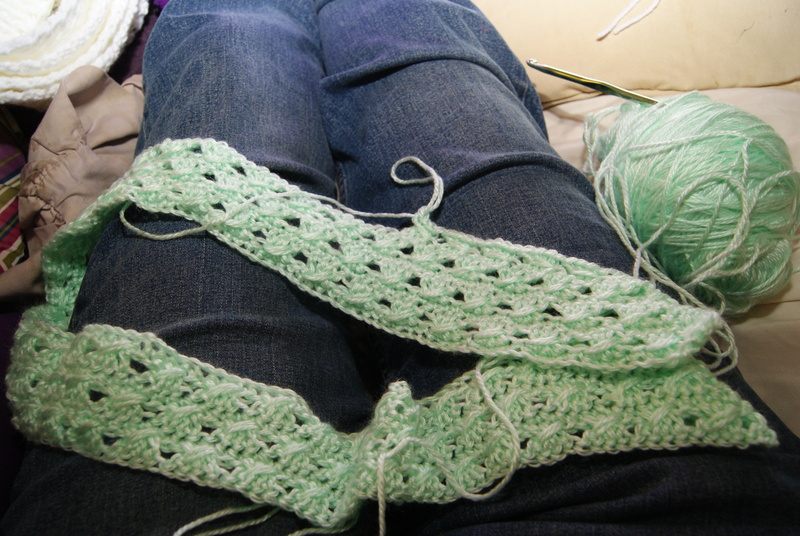 And this is the blanket in progress. I can’t be the only one who’s done it! You know what I”m talking about… that moment after you cut something – whether it be paper, material or something else. That moment after when you lift up your original project and find you added an extra cut… to something else. That’s right. I’ve done it on more than one occasion. I’m one of those people who doesn’t always sit at a craft table to do my crafts. I cut my yarn, or paper or whatever right where I am sitting… more often than not, it’s my bed. Yup, that picture right there is of one of my pillowcases. I sometimes forget just how sharp the scissors I use really are. Yes, they are high carbon stainless, and so sharp they can be used to cut fiberglass (although I don’t do so). I didn’t even feel any extra resistance when I cut either. (I’m hoping that if I get skin in there, I’ll notice BEFORE I cut into myself!) But there’s the proof… and I did it more than once. Ah, well, at least the pillowcase wasn’t expensive!